The U.S. Military has placed extra aircraft on standby in Italy in case the decision is taken to evacuate the American Embassy in Tripoli amid rising tension in Libya, defense officials said. 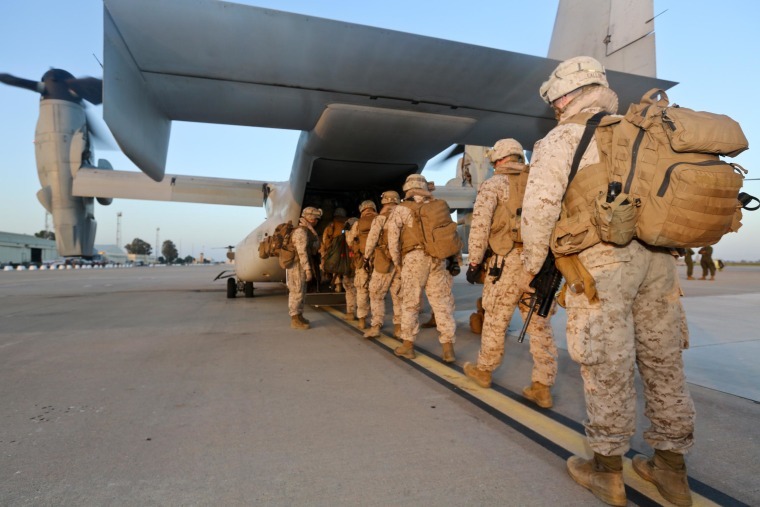 Four additional tilt-rotor Osprey transport planes and one additional C-130 Hercules were sent to Sigonella, Sicily, where nearly 200 Marines were already on standby. That brings the total number of aircraft to 8 Ospreys and 3 C-130s. The orders for the additional aircraft came after increased clashes between Libyan military forces and armed militant groups in and around Benghazi. Intelligence reports warn that the U.S. Embassy in Tripoli could get caught in the middle of battles between competing militia in the city. Officials said there were no indications that the embassy is under any specific threat, and the additional aircraft were ordered as a “prudent precaution” to cover all possible contingencies. Heavily armed gunmen stormed Libya's parliament on Sunday and gunfire erupted across Tripoli, where rival militias clashed in some of the worst violence in the city since the end of the 2011 war against Muammar Gaddafi. Saudi Arabia closed its embassy and consulate in the Libyan capital and withdrew all of its diplomatic staff on Monday due to security concerns. Underscoring the turmoil, the commander of Libyan army special forces said on Monday he had allied with renegade general Khalifa Haftar in his campaign against militant Islamists. Haftar has been denounced by the Tripoli government as attempting to stage a coup. The Marines in Sigonella are part of a crisis response unit focused on embassy security that was created after the attack on the U.S. diplomatic compound in Benghazi, Libya, on September 11, 2012, that killed U.S. Ambassador Christopher Stevens and three other Americans.